So the time has come to paint your living room. This is the final project that will complete the transformation of the house into your dream home. But how can you choose the right paint? There’s a lot of pressure on this project and it’s so easy to make a mistake. Don’t worry, the experts at Executive Craftsman are here to help! Painting your living room can be a painstaking process but we assure that you don’t need to over think this one. We promise that if you follow these awesome steps, you will never have a problem choosing the right paint color again. 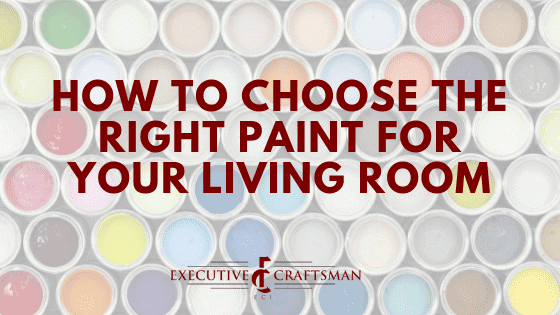 Let us guide you through picking the right paint for your living room. Before you even begin looking for paint for the living room, take a look around the house and see your color scheme. The last problem you want is having a color in the living room clash with the rest of the house. If you have a house that uses light blues and whites, would you want to have a living room that is a bold red? Just imagine what a shift that will be! Take some time to go through your home and take note of the colors you have previously used. The last thing you want is guests to come in and notice clashing colors. Take some time to analyze the color scheme of your home and let that guide you to the right choice. There must be a reason you went with that scheme through the house right? What color is your couch? This is the biggest question you are going to have to ask yourself when picking out a color to paint your living room. The furniture in a room can either complete or throw off the coloring. Would a smooth brown recliner look good in a room that is seafoam green? What about an olive green living room with a teal couch set? The answer is a strong no. The furniture helps bring the room together so the last problem you want to have is to go through the painting process only to realize nothing matches. Take a few moments and find out the exact color of everything in the living and make sure they will match your paint. This easy step will save you a world of headaches down the line. So you have found the color of your dreams, what are you going to do next? Explore all the different shades, of course. You don’t just have to take it at face value especially when you have an entire color wheel to explore. Sure, you can go with that basic red but have you consider the various shades the color has? There is more to color than meets the eye, don’t be fooled into narrowing in on one basic choice. Exploring the various options your color choice offers is key to picking the right paint for your living room. Painting the living room is likely something you will overthink but you don’t need too. Taking time to analyze the color theme of your home and living room furniture, using the color wheel, and making sure that you love the color you choose will give you amazing results. Don’t just settle on something that seems good, choose the correct color for your home. Nothing is more important, which is why the experts at Executive Craftsman are here to help. Let us guide you through the process and once you have chosen your color give us a call. Our expert workmen are the best in the business and will execute your projects to perfection. We specialize in both interior and exterior projects including remodeling, custom built-ins, additions, and more. Nothing is more important to us than the client and we promise that no project is too difficult for us to execute. Let us help you make your house into your dream home. To learn more about Executive Craftsman and home construction, read our blog.